The report’s pension liability numbers are based on the state’s numbers, which may not accurately reflect the true extent of Connecticut’s pension problem because the state uses a 6.9 percent discount rate for its state employee pension fund and an 8 percent discount rate for its teacher pensions. 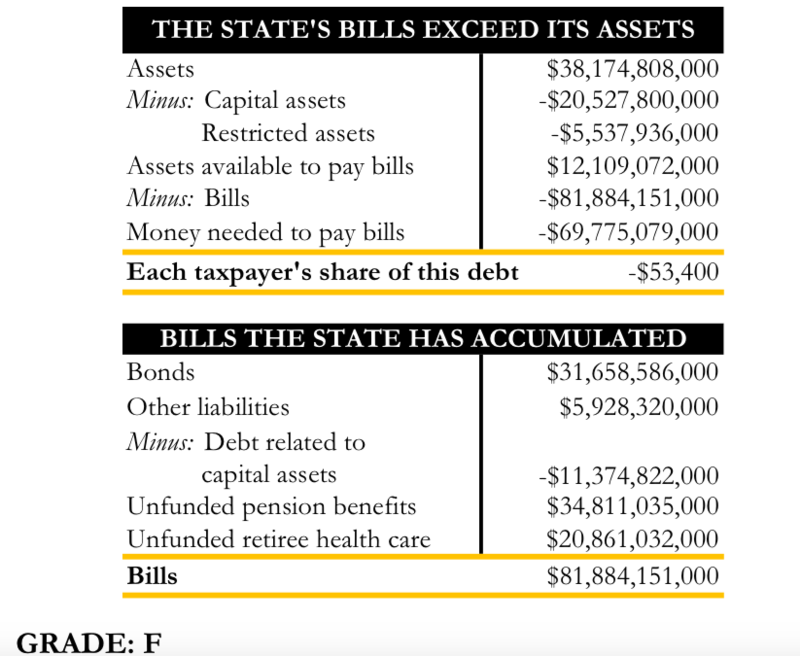 Overall, Truth in Accounting gave Connecticut an “F” due to its high debt burden and lack of transparency regarding its pension and OPEB liabilities. Yeah, they won’t approve CAFR1’s comment because this entire article is about unfunded liabilities so as to make everything appear to have all types of massive debt and deficits and CAFR1 will blow the lid right off that in every way. What is NOT being said or disclosed is the FACT that the method for determining “Net” liability allows for projecting out that liability 30, 35, up to 40-years out as if “due today”. Additionally, being an “Annual Budgetary” operation, “Income is only projected out 1-year. In effect what this does is: Create massive parking zones for asset wealth today for “projected liabilities” that may exist going out up to 40-years from now. Is the “projected income” going out 40-years included in the calculations? No, they are not. If you, I, Bill Gates, or Warren Buffet did the same thing, we all would look like we are on death’s financial door. Can Publicly Traded companies like Apple, Microsoft, IBM, or J&J do the same thing with their accounting and presentation to their shareholders? No they can not. If they did the same, projecting out liabilities 40-years and income for only 1-year as a cross match to show a lower or negative net-worth, creating a negative income report to shareholders, and causing a massive collapse of their stock by this type of presentation where they actually used covertly the parking-zone stashes of wealth to buy back the shares they issued at pennies on the dollar, if discovered by the SEC, immediately everyone of the directors from those companies involved would be indicted on a multiple count indictment by the SEC and summarily convicted. The actual issue in this article is the fact that Connecticut financial operations (getting an F-Score) are being forced to comply with the standards establish for ALL OTHER local governments that are complying with the new standards set by GASB, a “private” association comprised primarily of members that are top government financial managers. In reflection, GASB operations are like: Letting the Foxes write the laws as to how many hens are eaten by the Foxes from the Hen-House and how many the rancher gets and is required to have in the Hen-House for the Fox’s consumption. In summary, local governments through the creation of their own accepted accounting guidelines that they themselves create through membership with GASB are creating massive amounts of wealth for themselves (parking-zones) labeled as projected liabilities. Take a look at the Federal Reserve’s raw data from their Z.1. report that shows the “standing Wealth” held by local governments; Federal Government; the Private Sector; Banks; Brokerage; and Insurance Companies. The figures are in “billions” so when looking, note accordingly. Again, if a publicly traded company, of which are under “other” strict accounting guidelines overseeing their operations attempted to operate under the guidelines government created for themselves, you would be hearing the slamming of those prison doors after conviction by SEC indictment. But then, they do not write the guidelines for themselves, government oversees that arena. approve and post the CAFR1 comment!! !